The eagerly-awaited Route Creator for Forza Horizon 4 will arrive on Thursday, October 25th, developer Playground Games announced on the latest edition of Inside Xbox. The show was broadcasted live earlier this week from the Goodwood Estate in Chichester, England – the spiritual home of car culture in beautiful, historic Britain. 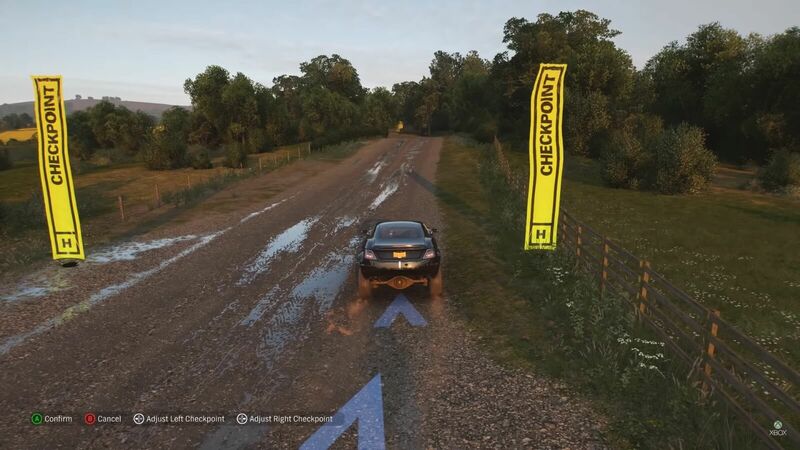 The Route Creator is being added with the first major post-launch content update for Forza Horizon 4, which also introduces several other goodies for fans to discover. These include the ‘British Racing Green’ Horizon Story, which will see you get behind the wheel of British automobile legends to help produce episodes of the Horizon Festival’s new motoring show. There’s also new clothing items and horns being introduced that are themed around Halloween, as well as fresh seasonal content like new events, challenges, exclusive cars, and more. However, because of the excitement and curiosity surrounding the Route Creator from fans, Playground Games decided to offer a deep dive into the feature in a dedicated segment on Inside Xbox, during which Xbox Live’s Graeme Boyd was joined by Creative Director Ralph Fulton to walk everyone through the feature. Firstly, when you arrive at any of the many race event points scattered across the map, you will see a new option once October 25th comes around – and that’ll be the ability to create a custom route. From there, you’ll be able to choose any car and simply drive from the starting line. The race route will be wherever you drive to, and at the push of a button, you’ll be able to drop a checkpoint and adjust how far the flags are from each other. Checkpoints can be dropped anywhere on the map, both on-road and off-road, and even on the roofs of houses and buildings – providing you’re able to reach them with your car! Routes are simply created by driving, and you’ll be able to see your race being made with the blue line that follows behind you. This allows you to play out your race as you make the route, which is great, so you can see how the event is shaping up before you finish it. Make a mistake? You can simply rewind to remove an unwanted checkpoint or route and then create a much nicer racing line. This allows you both unlimited freedom and ease-of-access when building unique routes. The total length of any race route you create can be up to 40-miles, which would take players around the game world “a couple of times,” according to Fulton. “I can’t wait to see how creative people are, and how they surprise us with the things they make,” he says. One of the examples shown during the Inside Xbox segment featured a route that extended onto the train tracks, which adds an element of both surprise and danger, as ‘The Flying Scotsman’ train could come blasting down at anytime since it’s on a continuous, repeated cycle. Once you’ve set your finish line on the track, you’ll be asked to test drive the entire route to ensure it’s playable, fully completable and works appropriately with Drivatars. Then, you will be able share the event online for the entire community to download and play. 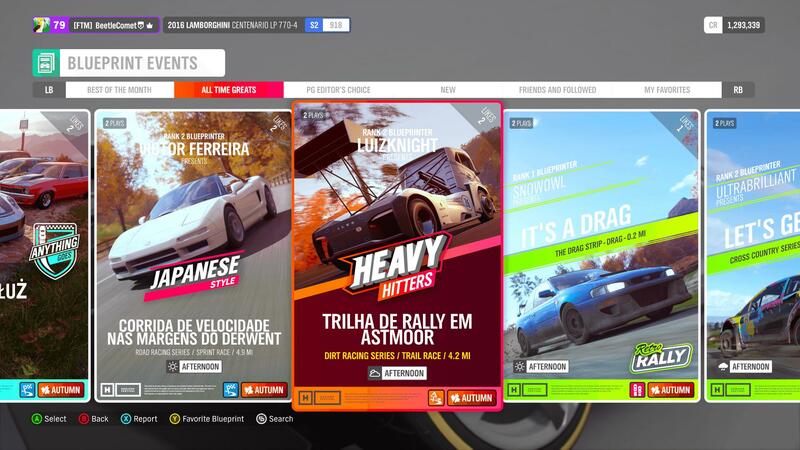 Forza Horizon 4 features an assortment of new curation tools for custom events, including filters that allow you to find popular routes over a specific timespan, trending events, those chosen by Playground Games and highlighted for the entire community to play, and more. You can also like or dislike custom events, but they’ll all be located under the ‘Community Events’ folder ahead of starting of a race. In addition, as you now Blueprint new Horizon events, you’ll be able to choose from the various routes you’ve created at that starting point, which offers even more freedom for custom races. You can also use Blueprint to change the season, as well as the time-of-day, weather conditions, the types of cars used, and more. Horizon Blueprint has always allowed you to make your race as specific as possible, using the conditions and cars you desire, but now it’ll allow you to throw your own custom race routes into the mix. 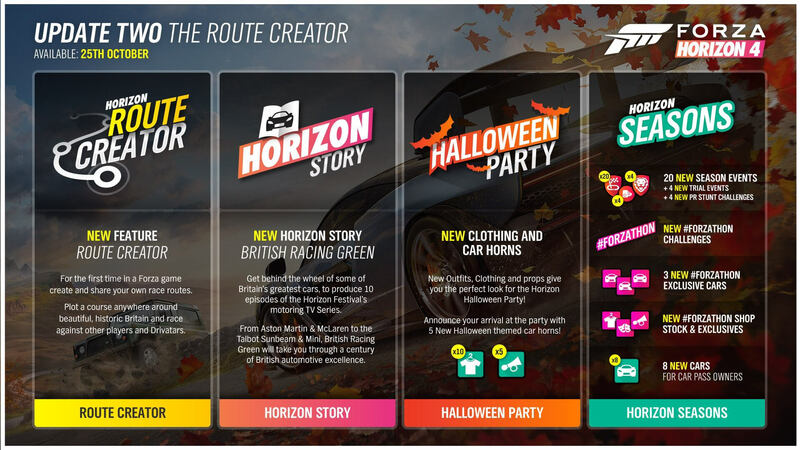 Overall, the addition of the Route Creator will see not only a host of welcomed tools to personalize your own events in Forza Horizon 4, but it’ll deliver even more opportunities for the community to have their creations spotlighted within the game. It also adds a lot of replay value to Forza Horizon 4, as you’ll always know that there’s new events to be discovered and played from the community – and the new curation tools in the game for these events will ensure that you find the best ones. As for the types of different race events and routes created by the community, only time will tell of course. But the wait won’t be too long. Forza Horizon 4 launches on October 2nd, 2018 for Xbox One and Windows 10 PC, as well as the Xbox Game Pass subscription service. It’ll be available four days early for Ultimate Edition owners from September 28th, but keep in mind that the Route Creator won’t be available until the first major content update rolls out on October 25th. For more, be sure to check out our in-depth review for Forza Horizon 4.